I have been on a coconut frenzy lately and can’t get enough of it. 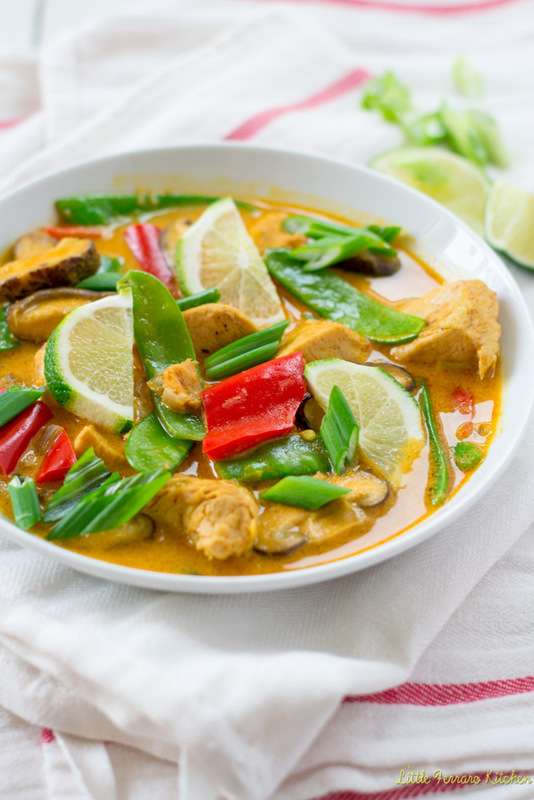 Coconut curry is usually on our weekly dinner rotation because it is so versatile Pair it with a spicy red Thai curry paste and you can put a tire in the sauce and it would still be finger-licking good. Ok, so granted this is no new recipe. I mean you can search for coconut curry and probably find a million hits. But..this is our curry. The curry we eat weekly, the curry we modify with whatever we have in hand. Sometimes we sub halibut in place of chicken which is fabulous. The fish cooks slowly in the sauce and we’ll serve it with quinoa. Today, we had chicken in the freezer because it was “clean out the fridge” day and added leftover veggies. Honestly, you can add anything and everything you want. I’ll walk through the recipe and share how we made dinner. A few gorgeous aromatics of lemon grass and lime really make the curry pop and add whatever ingredients you have on hand. Easy peasy. Don’t you just love easy-peasy 1 pot dinners? So if you have Facebook, we would love for you to join and be a part of it! 1) Saute onion, jalapeno in coconut oil until onion begins to soften. About 3 minutes. Then add garlic and lemongrass. Make sure to cut the lemon grass into large chunks and “bruise” it with the back of a knife to open up the fragrance. Toss around in the oil for another minute or so until garlic begins to caramelize. 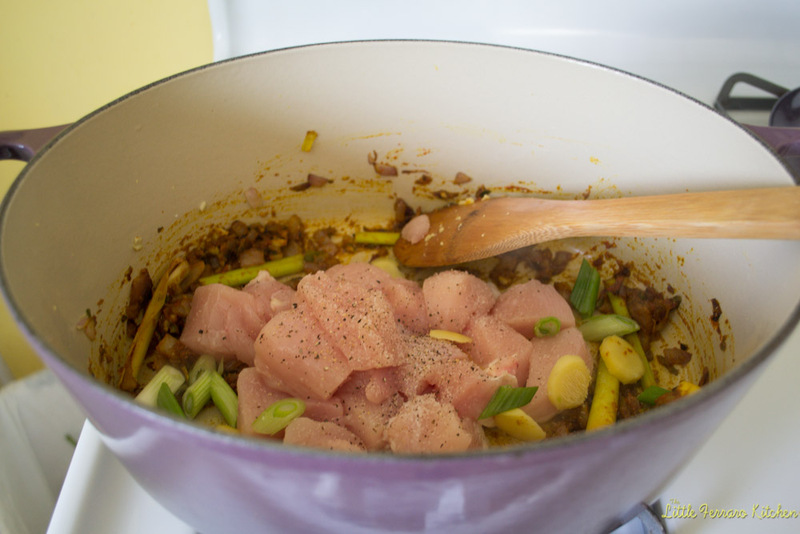 2) Then add spices (curry powder, garam masala and turmeric), fresh ginger and sugar. Toss to coat. 3) Add cubed chicken and season with salt and pepper. Toss chicken in the other flavors and allow to lightly brown on the outside. 4) Then add your veggies. Mushrooms, peppers and green onion. (Note* I also included sugar snap peas but did not add them until the very end to avoid over cooking). Toss to coat with everything. 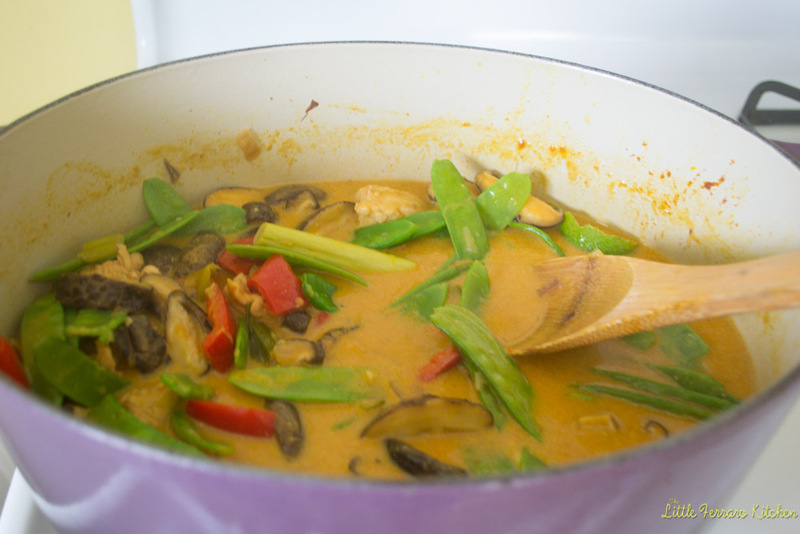 5) Add your liquid, coconut milk and 2 cups of stock or water and stir in curry paste. There should be enough liquid to lightly cover everything, so you may need to adjust accordingly. Also add a few dashes of fish sauce and sriracha (optional, for heat). 6) Cover and cook on medium-low until chicken is cooked through. About 20 minutes. When done, add sugar snap peas and lime juice (or strips of zest or sliced thin). 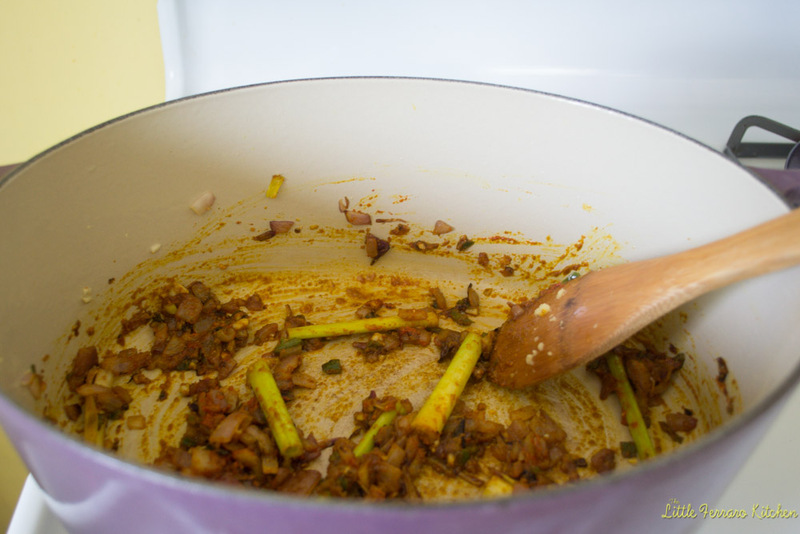 You can stir in the snap peas and the hot curry will cook it enough to be tender. 7) Garnish with green onion and lime wedges. Saute onion, jalapeno in coconut oil until onion begins to soften. About 3 minutes. 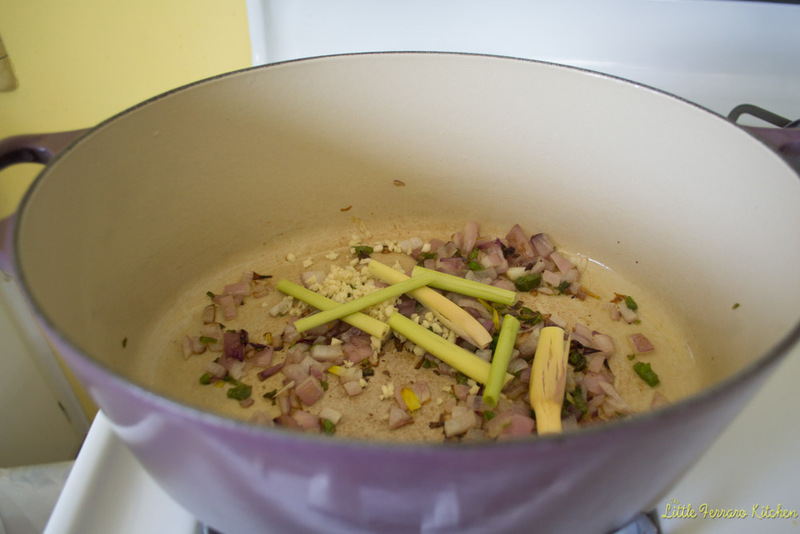 Then add garlic and lemongrass. Make sure to cut the lemon grass into large chunks and "bruise" it with the back of a knife to open up the fragrance. Toss around in the oil for another minute or so until garlic begins to caramelize. Then add spices (curry powder, garam masala and turmeric), fresh ginger and sugar. Toss to coat. Add cubed chicken and season with salt and pepper. Toss chicken in the other flavors and allow to lightly brown on the outside. Then add your veggies. Mushrooms, peppers and green onion. (Note* I also included sugar snap peas but did not add them until the very end to avoid over cooking). Toss to coat with everything. 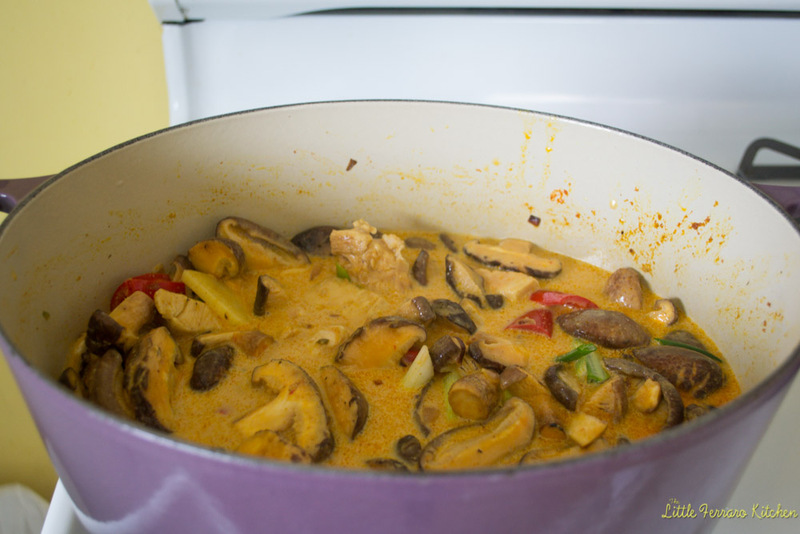 Add your liquid, coconut milk and 2 cups of stock or water and stir in curry paste. There should be enough liquid to lightly cover everything, so you may need to adjust accordingly. Also add a few dashes of fish sauce and sriracha (optional, for heat). Cover and cook on medium-low until chicken is cooked through. About 20 minutes. When done, add sugar snap peas and lime juice (or strips of zest or sliced thin). 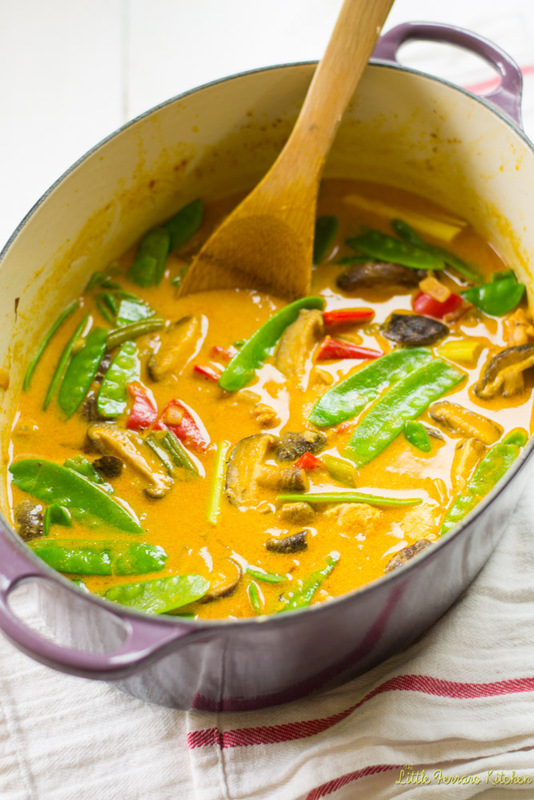 You can stir in the snap peas and the hot curry will cook it enough to be tender. Garnish with green onion and lime wedges. This is a very versatile recipe. Use any protein or vegetables you have on hand and adjust spice to fit your taste buds. Have fun with experimenting with different ingredients. Beautiful! I can’t get lemongrass fresh. Is there any substitute? Hi Mimi…I would suggest using long strips of lemon peel. You can peel it using your vegetable peeler. That shouldngive it a similar bright lemon flavor! 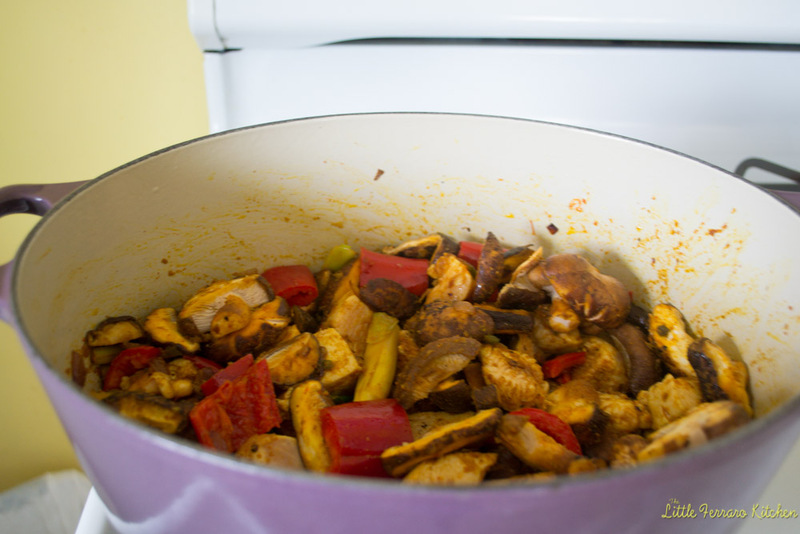 I could eat chicken curry every single day of my life and your recipe looks AMAZING! I love lemongrass and have never made chicken curry with it. The recipe may not be new to you, but it’s certainly going to get ravaged in my house! Oh man, we have been on a curry bender lately. 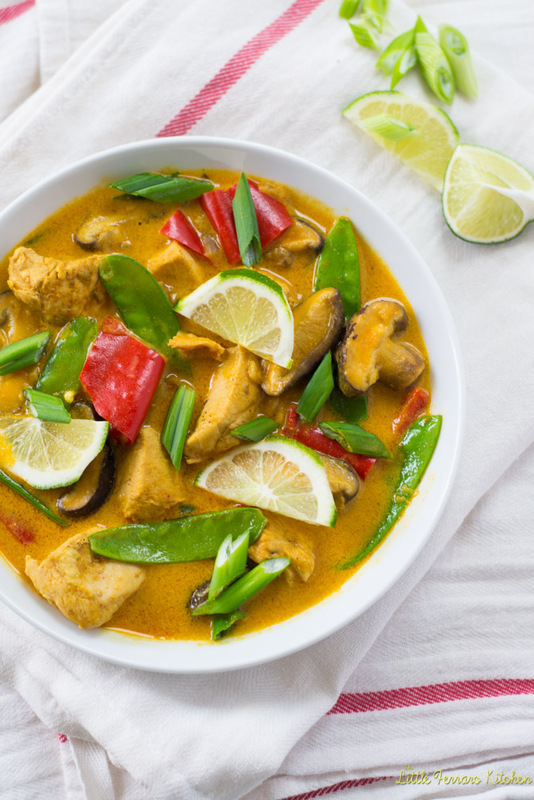 Mostly we stick with panang curry, but this looks like it needs to be added to the rotation! Thanks for sharing! Thanks Heather! I’d love to try different styles of curry! This looks like an awesome recipe. Can’t wait to try it! Your recipe doesn’t say- how much cubed chicken do you normally use with this? Great curry! Nothing to add or change. My family found it a little hot, but one can adjust the heat elements to match their taste. Was perfect for me! thanks for posting. Wonderful…thanks for letting me know Don! I was excited to make this but ended up somewhat disappointed. The flavour was overall delicious, but the confusion between Thai and Indian flavours didn’t quite sit right with me. The lemongrass fell apart such that we had to pick out all the woody bits of it. The sauce was watery and when I tried to boil it down to thicken, so the peppers ended up overcooked and mushy. I will continue on my mission to find authentic Thai curry made at home! Hi Sarah! I’m so sorry it didn’t work out for you! Lemongrass has layers, so I can see how different pieces came apart. Perhaps use less liquid the next time around and add the veggies in just 10 minutes before serving? 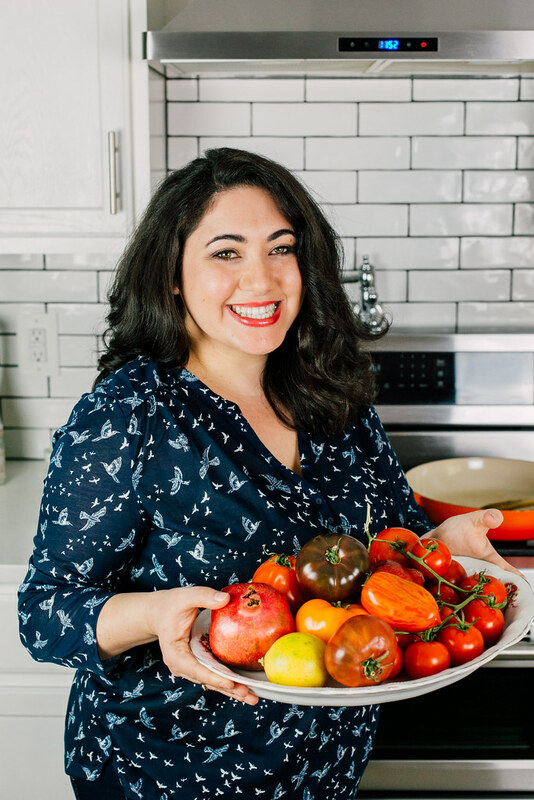 I hope you find a recipe that you enjoy and please let me know the outcome! Happy cooking! When does the curry paste go in? Making this right now and adding it with the liquids, thanks for the recipe! Hi Katie! It should’ve gone in with the other spices!! How did it come out? Cooking this now and it smells divine. I too missed the curry paste but have just added it with the liquid and am hoping for the best. Awesome…please let me know how it is!! I absolutely love this recipe, love cooking with lemongrass. I’ve made it twice in the past 2 weeks and both times it turned out great. First time I had a jalapeño but this time I just used 2 tbsp of siracha and it had the perfect spice. Both times I thickened it with 1 tbsp arrowroot powder with 1 tbsp water and stirred in slowly. I added the fish sauce this time and we do so again. This recipe is definitely getting bookmarked, I could eat it once a week, Thanks. Hi Kyle!! I love the additions you made and I think ‘ll try it your way next!! Add the Thai chile paste with the dry spices or the liquids? I’m new to curry but really wanted to give it a try. This was easy to do and was a huge hit with my S.O. I toned down the spice a bit by not adding the jalapeno or siracha. I didn’t have curry paste so I made my own based on a recipe I found online that had enough spice for me. I really enjoyed making this and really enjoyed eating it. I wish you guys could smell it, it smells absolutely amazing. I saved this to my Pinterest board so I could make it again. Thank you for sharing Tracey!! Your changes sound great! !